As a rule, we like to keep our content focused on positive things. However, since this blog is about urban wildlife, we’d have no conscience if we didn’t speak up on an urgent issue that is critical to our wildlife and to each of us here as residents. More than Thirty-five large trees and countless smaller ones have just been removed by developers in Historic Peachtree Park over the last few weeks from just 2 lots (696 Darlington Rd and 3005 Dale Drive). Some of these trees had an 80- to 100- year history of growth. This is a big blow. And more tree removal signs are up in other parts of the neighborhood. At this rate there won’t be any Park left in Peachtree Park. 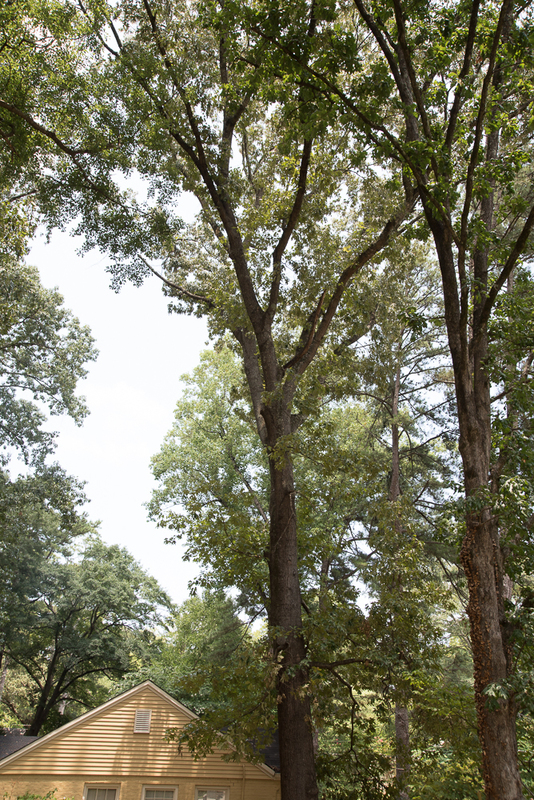 Over 20 concerned neighbors and the Peachtree Park board appealed to the City to save two large specimen oaks on the Darlington Road lot. You can see these magnificent trees in the photo on the left above. The appeal was denied and the result is shown below. Bottom line: a developer can build anything anywhere on a lot, and if a saving a tree is inconvenient, the City’s ordinances permit removal. In other words, trees come last. Aftermath at 696 Darlington Rd. Bluntly put, developers with no long term interest in this neighborhood, clear a lot, often overbuild the property, make a profit and leave. The developer, a temporary interloper and profiteer, is gone and so are the trees. This is by now an all too familiar pattern. Wildlife is victim to this staggering habitat loss. No trees: no bugs, no birds, no critters. We are all victims of this loss as well. We lose our tree canopy, shade, ecosystem services like controlling runoff and cleaning our air, and of course beauty. 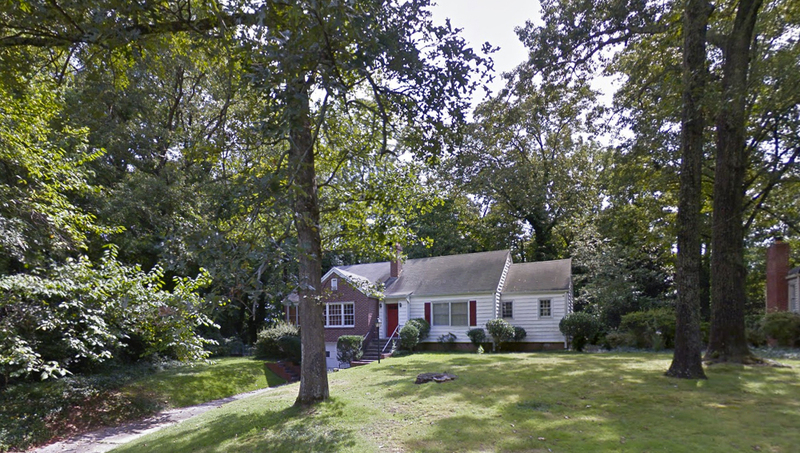 3005 Dale Drive was a wooded wildlife haven. It has now been mostly clearcut and lost more than 21 large trees. We love to talk about wildlife and the habitat that supports them. Are we willing to take action to stop its wholesale removal? There are developers and architects who care about trees and work hard to save them. If you’re renovating, seek them out and support them (some even live in our neighborhood). If you’re buying a home, find out what was there before. If the property was clearcut, tell your realtor to keep looking. Let’s raise the bar and send a message we care about trees. And you can support the Peachtree Park Board in their efforts to take a stand against this tree massacre. If you’d like to help, contact the PPCA Landscape Chair Michelle Lyle – mmlyle@mindspring.com. Think of it this way: If you have a young child and plant a tree in your yard now, your child will most likely not live long enough to see that tree live to be as old, large and beautiful as this one that was just removed on Darlington Rd. We have more information about trees on these pages: Trees & Plants, Tree Size and Age and Special Trees, and we’ll have a follow-up post with more things we can do to protect trees. The video below shows just some of the wildlife that, in one way or another, depend on trees. If the trees leave, so do they. Maybe the wildlife affected by the current habitat destruction will move into your yard where they’ll be safe. This entry was posted in Habitat, Habitat Loss, Neighborhood, Trees, Wildlife on August 14, 2016 by beveritt. P.s. The groundhog was seen last week but I wasn’t fast enough with the camera.